Well, fellow renovators my monthly update is in order. Still focused on the basement woman cave – and lots have been going on. I still haven’t gotten to the really pretty stuff, but we have to pay our dues in wading through the tedious stuff. So this episode focuses on that pesky door trim that you have to address if you have any type of hole in your wall. 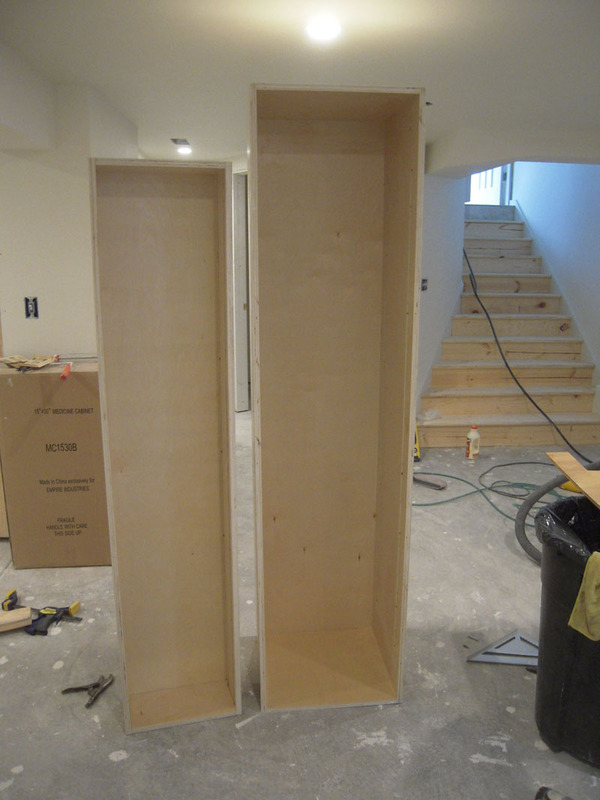 First we make a couple of plywood cabinet inserts. These are 3/4″ UV coated cabinet stock. 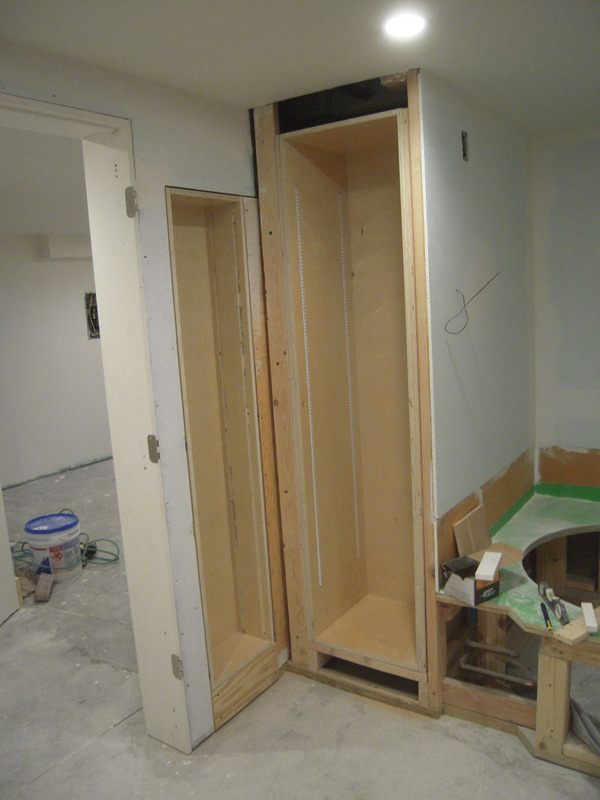 They will go in the bathroom – the one on the left will get a door mirror. The one on the right is open towel storage. They’ll need trim, right? And this is where they go in the bathroom. Uh, oh – looks like some complicated trim gymnastics coming up. First we figure out the pieces for the Tall cabinet and cut to size. 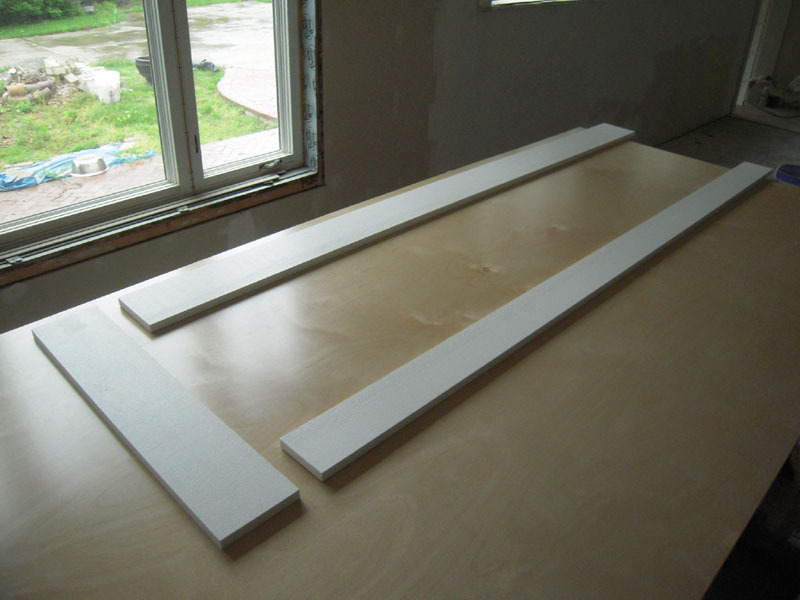 This is PVC trim – all of the trim in the bathroom is made from this material. Then we flip it over and mark where the screws will be drilled and a mark for the inside corner. 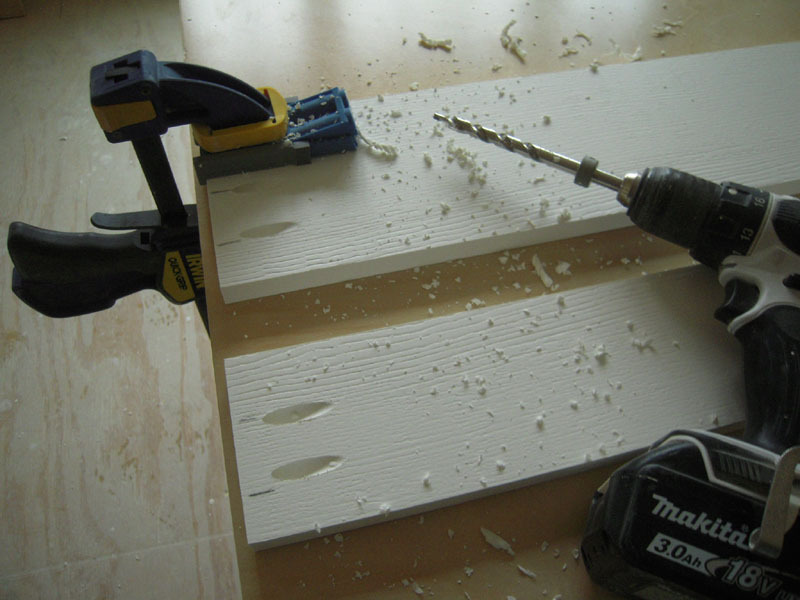 Then we drill the pocket screws using my cheap Kreg drill guide. 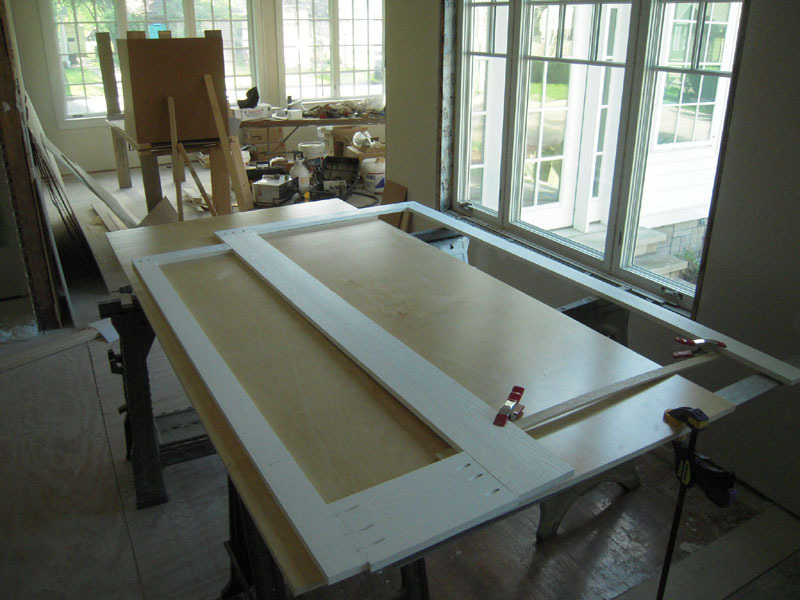 This system is great to make quick work of cabinet projects like these face frames. 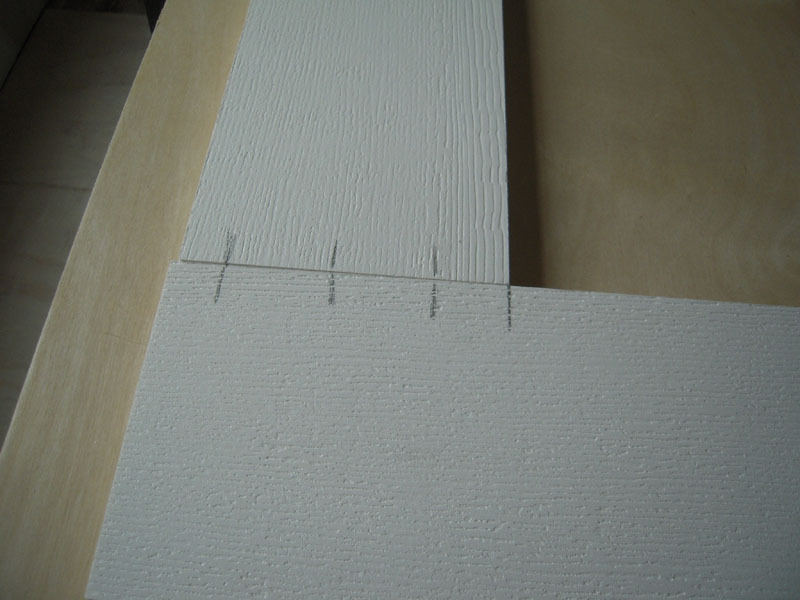 Each joint is coated with PVC primer and then general purpose PVC cement. Keep the cement a little ways away from the front face of the joint to keep the front looking pretty. 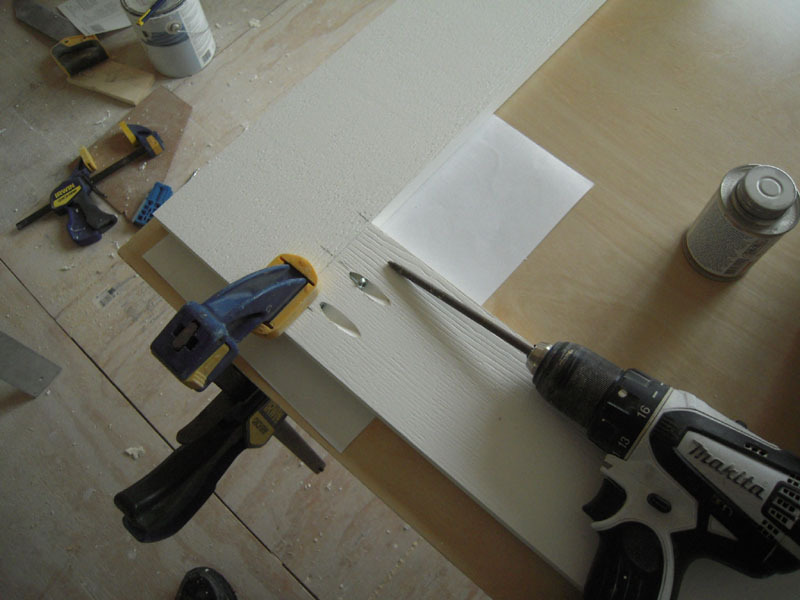 I then use a clamp to hold the pieces against the table surface while I set the screws. I use the clamp to keep the two pieces from shifting under pressure. This assures a nice flat face. If you have kept the glue off the face, you can sand the joint flush immediately. 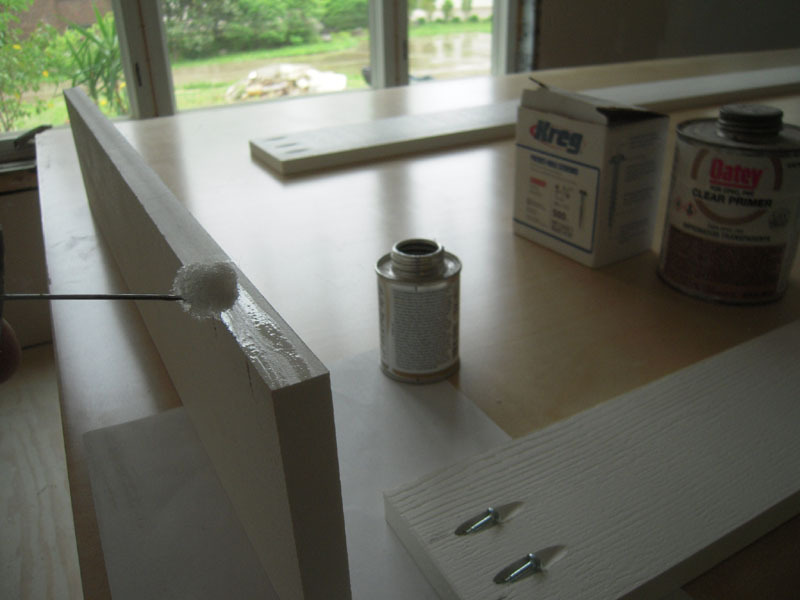 If you have solvent on the front, you’ll have to wait a day or two to sand, as the glue softens the PVC and it will be impossible to get a flush joint. Once the two trim assemblies are finished, it’s time to make it a little more difficult. 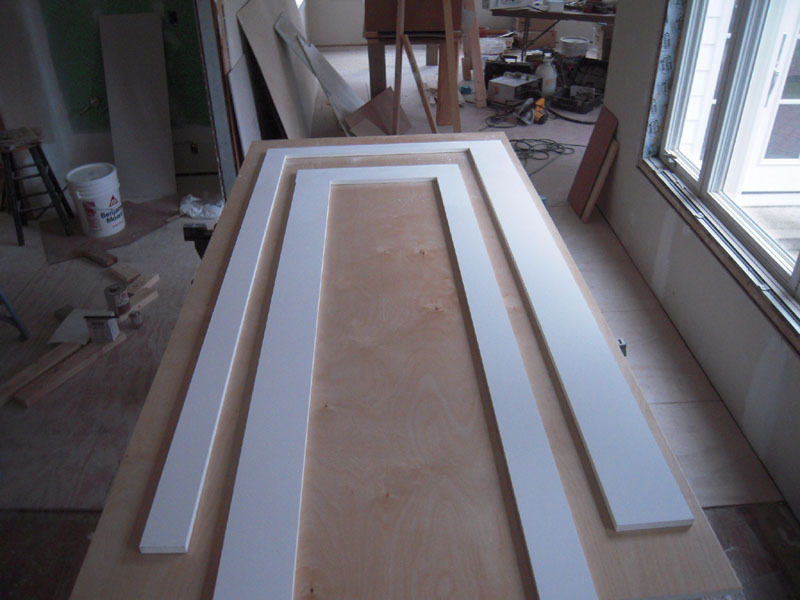 The trim to the right is for the door and the left is the trim around the cabinet insert. I’ve joined the two together to get super smooth joints. You’ll see how this all fits together in a later post. The two pressure clamps and a strip of PVC are used to stabilize this awkward piece without breaking the joints when moving to install. Since I’ve done every door, window and cabinet in this place with all new trim that I fabricated, I’ve had plenty of practice. 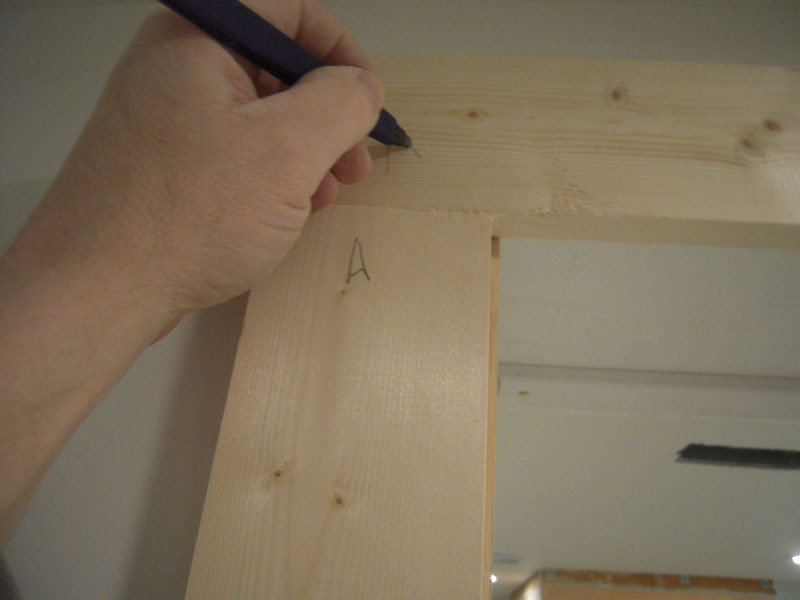 Here is the simplest way I’ve found to measure and cut door trim. First make a spacer for the reveal of the trim. This is the space between the interior jamb of the door or window and the start of the casing (the flat part that goes around the opening.) I take one side of casing and space it with my template. Then clamp the piece in place. Repeat the process on the other side. 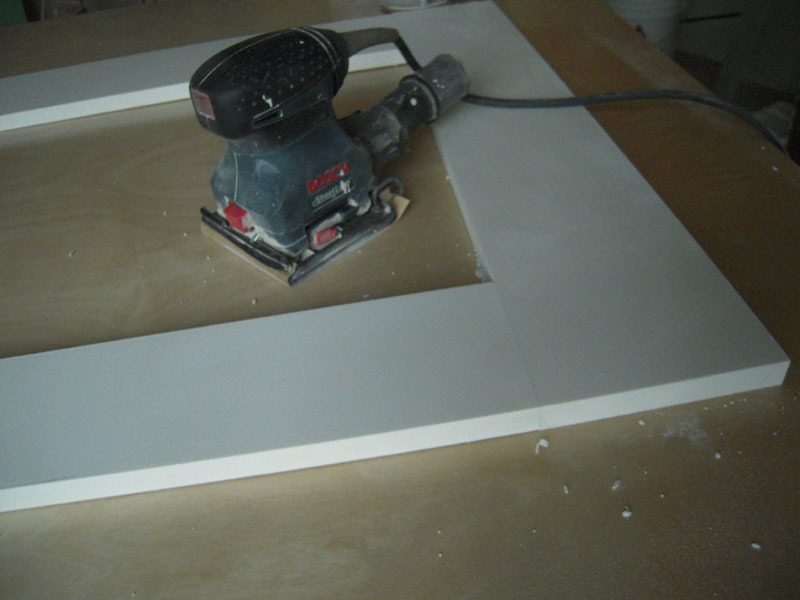 Make the casing sides the same length and let the bottom edge rest on the floor. Place a piece of casing along the top edge and mark the outside edge. I also put reference marks to keep pieces in order. I drill pocket screws and assemble just like I showed you earlier. Keep the outer edge of the side casings flush to the top casing to make sure the reveal is correct. 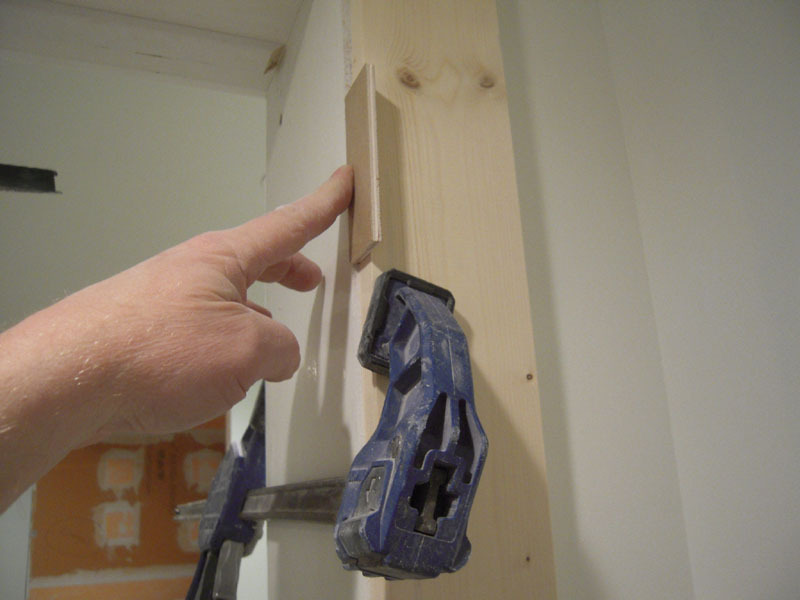 This makes a strong, flat joint and it will fit perfectly around your door. Pretty stuff coming up in the next post. Promise. 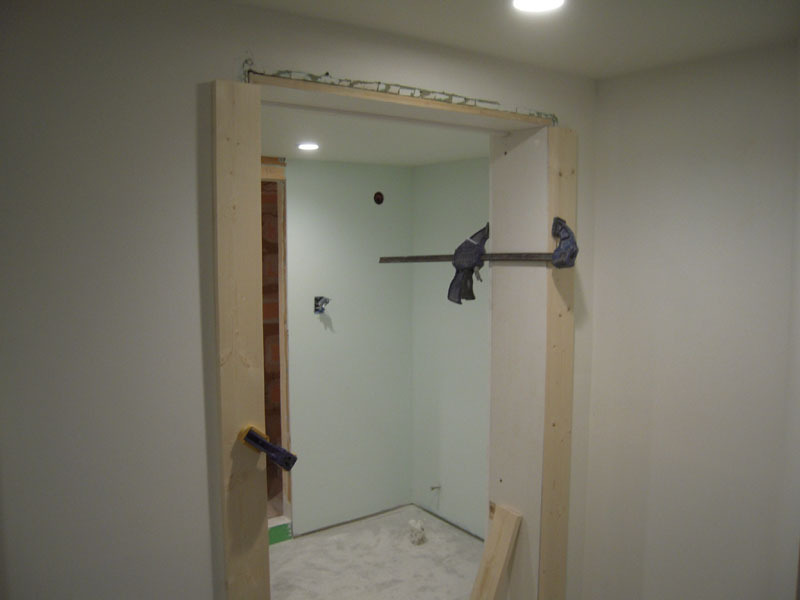 This entry was posted in Basement Renovation, Doors, Windows and tagged 1930's bungalow, basement renovation, door trim, Kreg joint tool, window casing by curt. Bookmark the permalink. Hey fellow renovator! 1) I have a garage and a small ‘clean room’ workshop next to her cave for framing artworks. She has the run of the basement. She has been so patient and has indulged in my 6 year renovation – I wanted to make something nice for her and her friends. 2) The top of the stairs is the mud room – you enter and can go down the stairs to the basement or go up the stairs to the kitchen – so I guess technically it’s below the kitchen. Having been married for quite a while, I have been trained not to be too sexist. I do make a mean cream puff, by the way. 🙂 I think I’ll get so some of the pretty stuff soon – I hope. All the best! Ha, ha – thanks Jacqui! Really not that difficult. 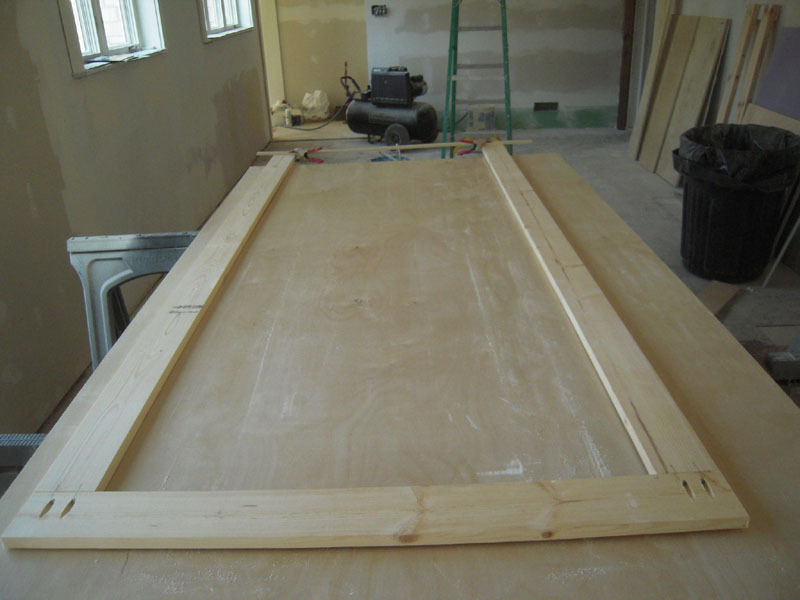 I do have an Amish company building my kitchen cabinets – I’d love to build them myself – but that would add another two years to the renovation. We’ll see how this turns out. Thanks for stopping in from South Africa. Great job with the pockethole jig as usual 🙂 your cabs look very neat, keep up the good work! Thanks Pete! Sorry for the delay in responding – trying to get this place habitable by the end of the decade!